Nigella Lawson will be in Seattle April 25. For tickets to her talk and book signing at the Stroum Jewish Community Center, visit sjcc.org. Jewish in Seattle: After publishing 10 cookbooks, what did you want to do differently when conceptualizing At My Table? Nigella Lawson: When I embark upon a cookbook, I never see it in terms of anything other than the food, but from there, once I’ve been cooking and writing the recipes, the book takes shape more definitively. With At My Table, I felt very strongly that it did not suit having the sort of chapter demarcations I’ve used in any other of my books. And I have to say that I have used very different sorts of chapter titles and grouped recipes in often idiosyncratic ways, but none of that felt right for this book. I’ve never come across a cookbook without any chapters or sections, but I knew this book had to be without any overarching structure. I felt further emboldened to do this after looking at the various e-versions of my books, in which we put a list of all the recipes at the front. So I borrowed this for At My Table, and I think it works beautifully. The recipes can just flow freely, but there is order at the beginning — with the list of recipes — and at the back, with the index. Now, of course, I didn’t run the recipes totally randomly, but nonetheless I didn’t impose a structure on the book that didn’t belong to it. Your family was largely nonobservant. What prompted you to learn more about your Jewish lineage? Has your identity shifted since participating in the genealogy TV show Who Do You Think You Are? Although it’s true I come from a non-observant family, I am very much at ease with my Jewish identity. And actually, for all that I do not observe Jewish dietary laws, I feel it very strongly in the kitchen and at my table. When asked to do Who Do You Think You Are, I was very interested, though chiefly, I seem to remember, I wanted to find out if my mother’s family had Sephardi roots (the answer turned out to be no! ), but other than that I had no sense of looking for answers. It was an unsettling experience, but then that is unsurprising. The Jewish legacy is one of suffering, and you cannot investigate the past without unearthing that. But it was also inspiring: I was touched by the proud desire of those immigrant ancestors to be English. I did find out things I just hadn’t known, and it made me aware of how recent, in the scheme of things, the struggles and difficulties had been, and I ponder on this often. Are there any restaurants on your list to try while in Seattle in April? There certainly are. I am really keen to go to Westman’s Bagels, Wataru, Harvest Beat, and Tarsan i Jane. Well, I doubt I will manage to get to all, but it’s a wonderful list to aim for. And I’m always happy to get recommendations on the ground! Nigella recommends preparing these Passover-friendly recipes from At My Table at your seder: Tomato-Horseradish Salad; Spicy Mint Lamb Chops with a Preserved Lemon and Mint Sauce; Pear, Pistachio, and Rose Cake; and Chocolate Olive Oil Mousse. One of the most gratifying things for a home cook is to scrummage a meal together out of leftovers. It’s enormously satisfying to ransack the fridge and use up what lies under plastic wrap or is lounging about in the vegetable drawer; it always provides a relaxed, unforced creativity. I certainly would never have thought of using horseradish as a dressing for a tomato salad if I hadn’t wanted to find a way to use up a horseradish root staring beseechingly at me every time I opened the fridge. 1. Stir the grated horseradish and vinegar together in a small bowl, then add the oil, salt, and sugar and whisk a little with a fork, just to combine. Cover with plastic wrap and let stand for a while, if time permits. 2. Tumble the halved tomatoes into a large mixing bowl, add the dressing, and mix everything gently but thoroughly together. Cover the bowl with plastic wrap and leave for 30–60 minutes, by which time the tomatoes will have given out their fruity juices, which duly mingle with the fierceness of the horseradish. 3. 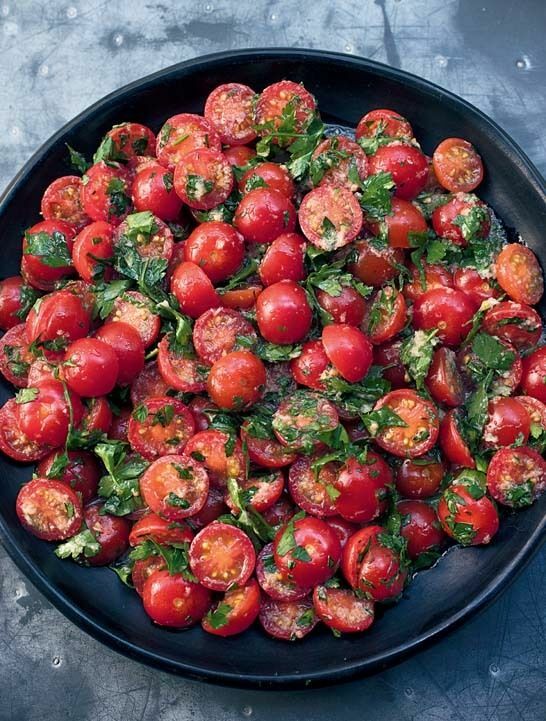 Toss the tomatoes tenderly in their bowl, then add the parsley leaves and toss again gently. Decant to a smaller serving bowl or a large plate and take to the table. Although not an instant dinner, this is nonetheless simple and speedy to make. You do need to marinate the lamb for 30 minutes or so, but you can pour yourself a glass of wine, sit back and enjoy it, then whiz up the mint sauce in the meantime. Speaking of which, this is a simple, spontaneous reworking of the old-fashioned vinegary mint sauce my mother used to make, using ingredients from my kitchen now. Namely, I saw two preserved lemons left bobbing hopefully about in their jar, and thought this would be an excellent opportunity to use them up. It was: The preserved lemons’ intense and scented sourness counters and enhances the mint perfectly. 1. Put the lamb rib chops into a resealable plastic bag and add the olive oil, finely grated zest and juice of the lemon, dried mint, red pepper flakes, salt, and minced garlic. Seal the bag and give a good squidge before marinating for 30–40 minutes, long enough for them to come to room temperature. 2. To make the sauce, put the mint, garlic, preserved lemons and juice, and half the oil into a bowl and patiently blitz with an immersion blender. When most of the leaves have been incorporated, pour in the remaining oil and blitz again, until you have a deep emerald, emulsified sauce. Taste to see if you want to add salt, though I find the preserved lemons give all the salinity you need, and I am an enthusiastic salter. 3. Heat a grill pan (my preference) or heavy-based frying pan, then lift the cutlets out of the marinade and cook them over a high heat — if you want them a little pink — for 2 minutes each side. But check and cook longer as needed. 4. 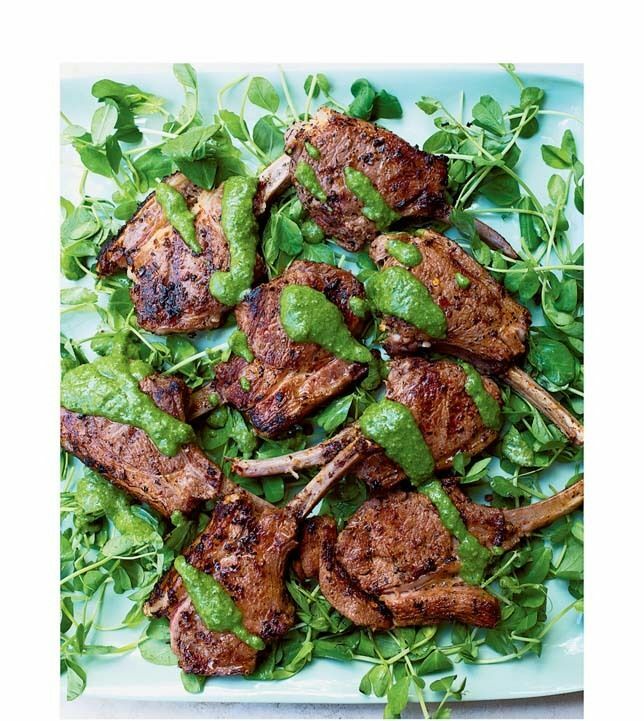 Arrange the lamb cutlets on a plate, lined with the greenery of your choice. Serve with the fragrant, sharp mint sauce, drizzling some on the cutlets too, if you so wish. I first came across a version of this voluptuously soft, rich chocolate mousse at Morito, one of my favorite places to eat in London. Then — as these things tend to happen — I started finding it everywhere. The olive oil doesn’t just bring its resonant flavor to the mousse, it creates its smooth, soft texture. Go for a smooth but still spicy rather than raspingly peppery extra-virgin olive oil, and use the absolute best quality you can. 1. Melt the chocolate either in the microwave or in a large heatproof bowl suspended over a saucepan of simmering water (but not touching the water), making sure — either way — you remove it from the heat before it is completely melted, then stir it gently so that the last little pieces of chocolate dissolve. Leave to cool for 10 minutes. Stir in the oil to combine and set aside for a moment. 2. Whisk the egg whites and a pinch of sea salt flakes in a grease-free bowl until you have firm peaks. Set aside for the moment. 3. In another bowl, large enough to take everything later, whisk the yolks, sugar, and ¼ tsp of sea salt flakes until pale, thick, and about doubled in volume. You don’t need to clean the beaters when going from whites to yolks. 4. Gradually pour the chocolate-oil mixture into the beaten yolks and fold to mix completely. Add a third of the beaten egg whites and fold in vigorously to lighten the mixture; no need to be delicate at this stage. Now gently fold in another third of the egg whites and, when that second lot is incorporated, fold in the final third leaving behind any liquid at the bottom of the bowl of whites. No white streaks should be visible. 5. 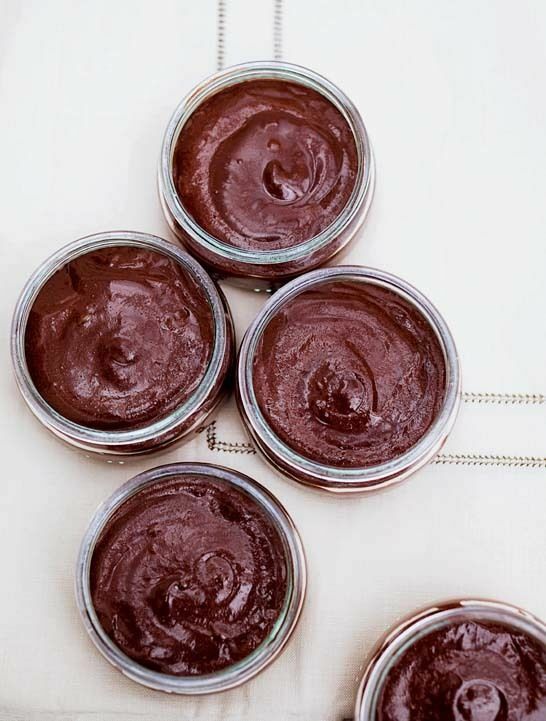 In a rather free-form way, gently spoon the mousse into your ramekins or cups. To get the right texture — soft and satiny, rather than set like a more traditional mousse — you can either refrigerate for 20 minutes then eat straight away, or for exactly one hour and then take out to come to room temperature for 40 minutes before eating. This is a delicately perfumed confection: yes, a cake, but no ordinary cake; the fruit keeps it so tender and damp that it’s as if it’s been drenched in light, scented syrup. I’ve been bold with the amount of rosewater here, but with the pears and pistachios, it strikes only the most fluttering of floral notes. 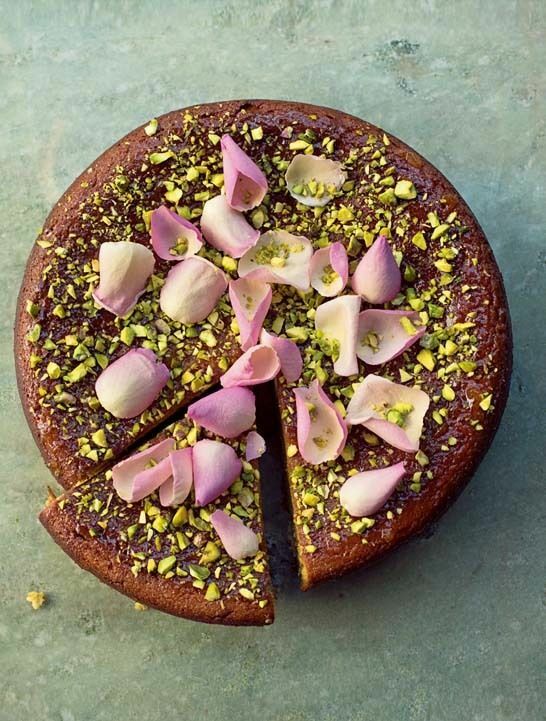 True, the amount of rose petals I strew on top makes it look as if you might just as well wear it on your head as eat it, but it’s the sort of cake that invites exuberance. 1. Grease the sides and line the base of your springform cake pan with parchment paper. 2. Put the sugar and ¾ c of pistachios into a food processor and blitz until the pistachios are finely ground, with a few nubbly bits, too. 3. Add the remaining cake ingredients and blitz until everything is smoothly combined and the pears have been puréed into the batter. Remove the blade, scrape down the mixture, and use the spatula to help ease every bit of batter into the prepared pan. 4. Bake for 40–50 minutes, though take a look at 35, and if the cake looks like it’s browning too fast, loosely cover with aluminum foil. When the cake’s ready, it will be brown on top, beginning to come away at the edges, and a cake tester will come out with just a few damp crumbs sticking to it. 5. Sit the cake on a wire rack and leave to cool completely in the pan; like all flourless cakes, it will sink a little. When the cake is completely cold, unclip, remove the base, and transfer to a cake stand or plate. 6. Mix the preserves, lemon juice, and rosewater together in a cup, then brush this glaze over the surface of the cake, removing any small blobs of apricot if there are any. Scatter with finely chopped pistachios and strew with rose petals, then sprinkle a few more pistachio crumbs on the top.